Nevertheless, there’s a case to be made for external reminders to help focus on something that otherwise tends to get lost between the cracks of everyday life. When you’re up to your elbows in dirty nappies and spilled juice, there tends to be a single focus in a couple’s conversations. It’s easy to forget that as parents, you don’t stop being a couple. So using Valentine’s Day as a cue is not actually a bad idea. However, with both of us ranking rather high on the introvert spectrum, there’s little enjoyment in spending a night in a crowded restaurant on February 14th. 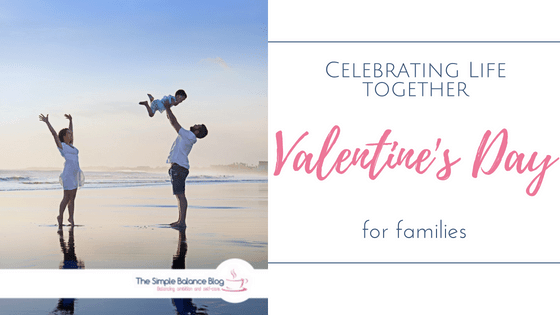 So I loved this idea of Valentine’s Day for families over at the Power of Mom‘s. For me, the best part about this concept is including our children in the celebrations around love. Despite the hard job that parenting is, we still love being their parents and I’m not sure that message comes across clearly in the daily frustrations of sibling squabbles and disgusting vegetables at dinner. 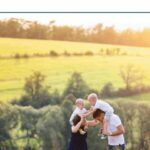 Focusing on being together, spending quality time with each other and making a regular day just a little more special offers an unusual bonding experience as a family. So using the heart theme of Valentine’s Day is perfectly in keeping with the idea of this special day. Start by collecting a few ideas. We’re not talking about a weekend trip to Disneyland but more along the lines of cooking (or ordering) a special meal together, playing a favourite game and have a tickling fight on the couch. It can be any day of the week, although moving it to a weekend is certainly not a bad idea either. If you’re in the middle of surviving life with a newborn, it is also perfectly okay to keep it utterly simple. There’s going to be another Valentine’s Day next year when you’ve had a little more sleep. Simply jot down 5-7 small things that you could sprinkle throughout this day to make it special. My go-to place for gathering ideas is Pinterest and depending on your energy levels, you could go all out by adjusting some of the many inspirations there to a family theme. Keep in mind how much energy you have and then pick your activities accordingly. You could have heart-shaped food or pink layered smoothies. You could go for a walk or visit an indoor playground. For your kids, it might be super fun to simply use the bus for a ride around town if this isn’t something you normally do. Depending on what February weather is like where you live, you may want to have a picknick on the living room floor instead of the park. To make it visual for your children, create a simple map for the day. 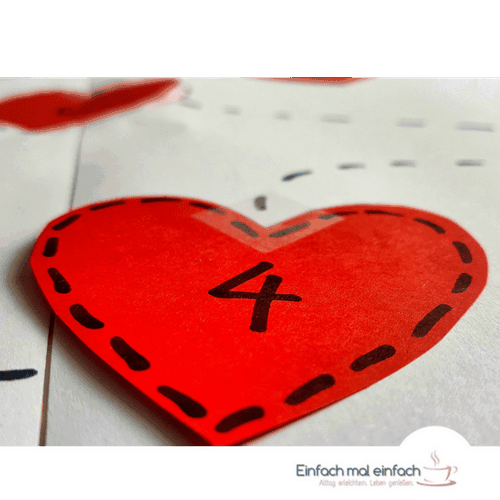 Use heart-shaped post it’s or cut out a few paper hearts and write each one of your activities on the back of a heart. Then stick them to a large piece of paper (or your fridge) and number them in the order that you will be doing them. Connect the hearts with a dotted trail so it looks a little like a treasure map. You could also simply use a dry erase marker and mark the trail right there on your fridge door. Tell your kids the night before what is going to happen and that you will reveal one activity at a time. Then, just enjoy as you go through your day and make sure you take in the special moments you are creating. Just as with any regular Valentine’s Day special, there’s a risk of high expectations, born out of idealistic Pinterest images, crashing on the rocks of reality. You probably won’t have each family member breezing through a pink coloured, heart-shaped day blissfully. It’s more likely your kids still squabble or pick out all the green bits. 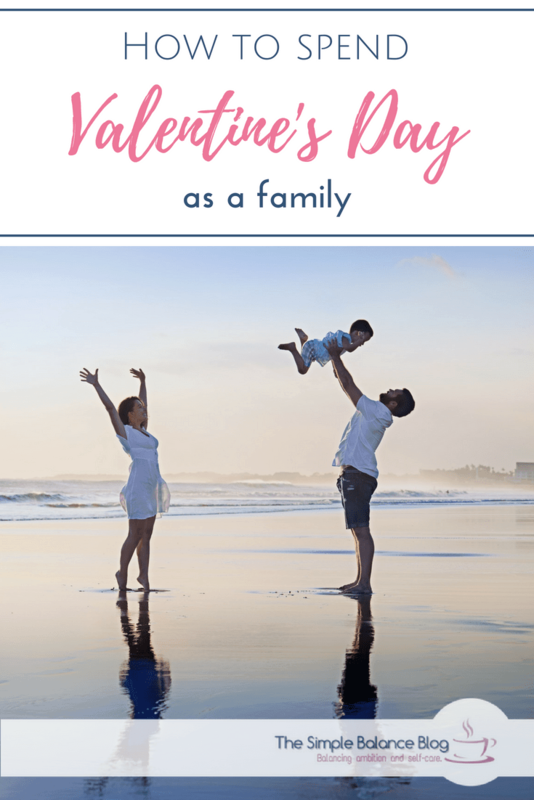 If you keep the image of a picture perfect family day out of your mind, you are more likely to enjoy the few near-perfect moments that are hidden among all the regularity of this day. And so this day might actually be good practice for the other 364 days of the year. 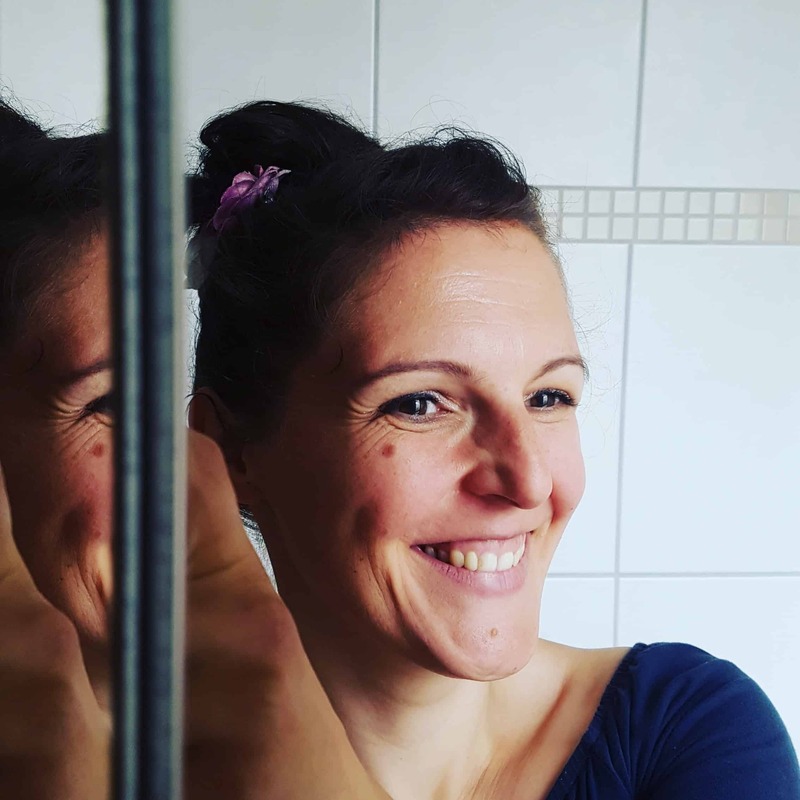 Not expecting anything to be Pinterest-perfect, but savouring the hidden gems in everyday life – with poop leaking nappies and supermarket tantrums sitting right alongside the cuddles and confessions of love by a 2-year-old (“You de mom in de best wold!”). So go ahead and mark a day on your calendar – February 14th or any other day of the year – as Valentine’s Day for your family. You might just be surprised at how much of an impact the simplest of activities can have on your kids and yourself. I’d love to be inspired by what you did to celebrate everyday life as a family, so be sure to leave a comment!